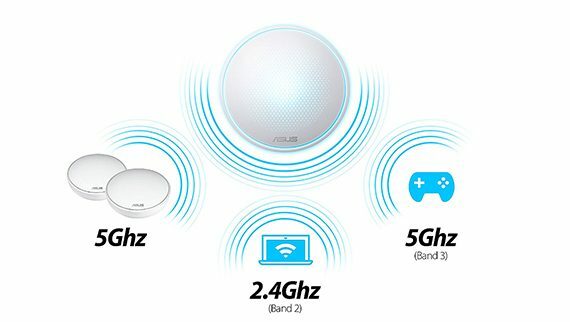 Asus did not immediately jump on the bandwagon of WiFi mesh systems and it seemed to take its time to carve the perfect set of devices which, when released, would dominate the market. Well, the Asus Lyra is not really the mesh WiFi systems’ Messiah and the manufacturer did not find the perfect balance between a high speed performance and the proper managing of a larger number of clients, but the Lyra still has managed to be a reasonable tri-band WiFi system which can handle a decently sized home network. 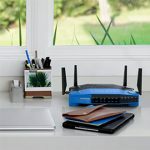 Unlike its main competitors (such as the Netgear Orbi, the Linksys Velop or the latest Eero 2nd Generation), it did not seem to stick that well to the general public since the mesh system did not really rise up to the users’ expectations – although it had some time to learn from the mistakes of its competitors and perhaps, it could have been better received if it came a year before its release date. I was actually tempted to say that with the release of the AiMesh, Asus did not seem to have that much confidence in the Lyra, but the release of the Lyra Trio and Voice systems goes against this point (the AiMesh is compatible with some Asus routers and it allows the user to recycle some older devices and making them reliable nodes to a mesh WiFi system). 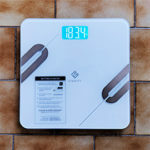 That being said, the Asus Lyra is really not a bad system (it’s not great either) and since it has undergone some updates, let’s have a look if some things have improved and if it can be considered a worthy competitor to the already established competitors. 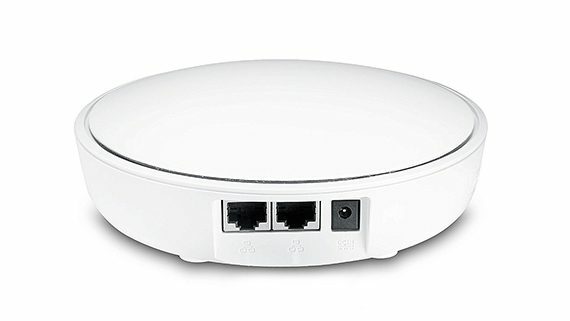 The first time Asus has announced its first WiFi mesh system, it came with the Hivespot codename and, while it has later changed it to the Lyra, I can see what type of concept the designers had in mind while building the device. 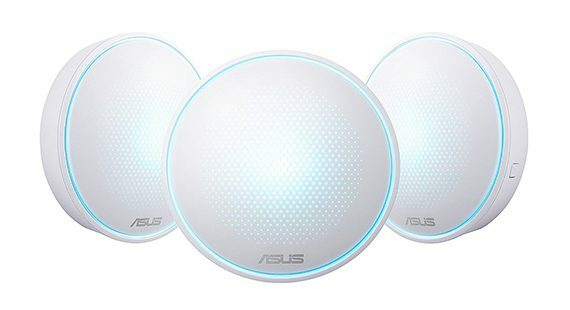 The Asus Lyra comes with three identical units, each featuring a round case (covered with a white matte finish which does not retain fingerprints), with the top area being slightly inflated towards the middle to resemble a shallow cone. 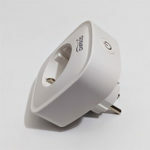 It’s clear that the Asus Lyra has followed a similar design footprint as the other WiFi systems, also focusing towards minimalism and simplicity, but it has added a novelty element in the form of small puncture holes on the top area and from underneath them, a LED light up to give the impression of a honeycomb. So, the original point of the Asus Lyra seems to be to create an entire hive network with lots of tiny nodes (Hivespots?) positioned all around the house (I know, it’s perhaps as tacky as the TP-Link’s ‘DECOrate your home with WiFi’ approach). 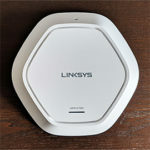 Each of the three units measures 5.89 x 5.89 x 1.94 inches, so it’s larger than Samsung Connect Home, Eero Second Generation, TP-Link Deco M5 and the Google WiFi, but still smaller than the Linksys Velop and Netgear Orbi which went a completely different design route. Furthermore, because of their appearance the nodes of the Asus Lyra system can be easily placed anywhere in the house (yes, it’s even living-room friendly and, if you dislike the top RGB LED light, it can be disabled) and thanks to its smaller height, you don’t have to worry about it accidentally falling from the edge of a desk. On the bottom of every Lyra unit, there are five silicone feet which, besides being tall enough to allow a good ventilation, they have proven to stoically keep the case from budging. Besides the five feet, the bottom of a Lyra router is covered by lots of punctured holes which indicates that Asus has taken seriously the impact of high temperatures onto the internal hardware over time, so I have not notice any attempts at overheating from any of the three Asus Lyra devices (something that neither Google Wifi, nor Eero second generation can pride themselves with). 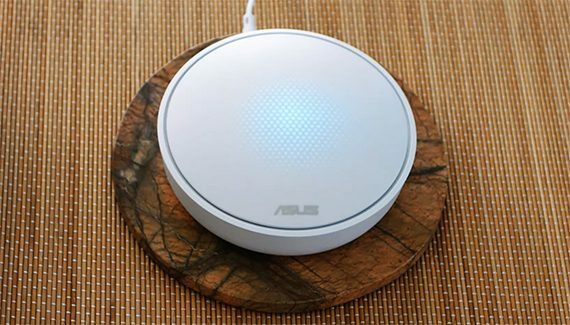 One advantage that the Asus Lyra has over most other WiFi systems is the ability to be mounted on the wall or ceiling (using the two dedicated holes on the bottom of the device – you don’t really have to worry about covering the vent cut-outs, since the feet are tall enough to ensure a proper airflow). Besides the top LED, the light also shines from the narrow canal which surrounds the upper area and, unlike the traditional array of LED lights which shows the status of individual functions of the router, the single LED approach will indicate the status of the system via different colours in various stages: if the indicator is solid white, then the device is ready to be set up, while, if it’s flashing white, then the node is setting up using the app; if the LED is changing through various colours, then the device is booting up; the LED will be light cyan when everything is working properly and it will be red when a secondary unit has lost connection to the main router (move it closely); if the indicator is orange, then there is no Internet connection available; the LED will blink green when a Lyra node wants to be paired to the network. I’m still unconvinced by the single LED implementation and, while I definitely understand the need to simplify the design and make everything more accessible, I don’t think any person will know what those flashing or solid colours will mean (except maybe for the ones who projected them) – sure, red is quite universally used to indicate an error, but for everything else, you either need a manual or pray for the integration with Alexa (with the latest firmware (Version 3.0.0.4.382.11464), the Lyra Home which I’m reviewing does seem to have added support for Alexa – as a side note, the new Asus Lyra Voice uses an Alexa speaker). 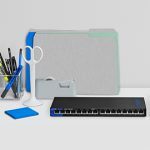 If you go around the device, you’ll notice that the design continuity is broken by a carved-in area, where you can find two Gigabit (10/100/1000 Mbps) RJ45 ports, from which the first is WAN/LAN, so it can be used for the connection with the modem (only one device needs to be connected to a modem, while the rest will be able to use both of the ports for LAN) and next to these ports, there’s a DC-In Power port (there is no USB port and that’s not really a minus since no other WiFi system has really taken advantage of it in a proper way). 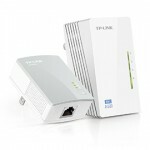 At the time of release, the Asus Lyra did not support Ethernet backhaul, but with the January update, the inter-node wired connection is now officially out of the beta stage, so you can use one LAN port to connect the Lyra nodes via wire (of course, the LAN ports can also be used to connect wired clients, if you don’t need the Ethernet backhaul feature). Close to the ports area, also rests a Pairing button (which can be used only to pair nodes with the primary Lyra) and on the bottom side, you can find a relatively large Reset button (to perform a hardware reset, press the button until the LED flashes orange and then wait for the LED to become solid white – this indicates that the Lyra unit has been reset). 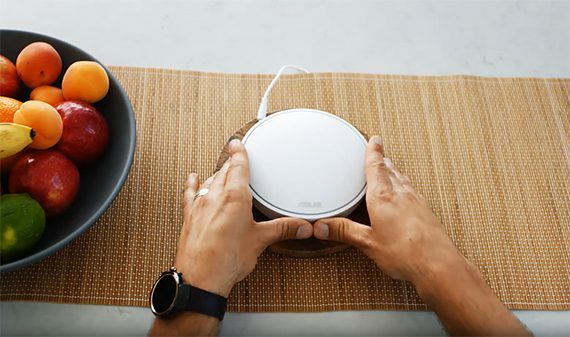 Asus has equipped every Lyra unit with a quad-core Qualcomm IPQ4019 2×2 SoC, clocked at 717 MHz (similarly to both the Google WiFi and Eero Generation 2). There’s also a Qualcomm Atheros QCA8072 switch chip, 128 MB (Macronix NAND) internal storage and 256 MB of RAM (Nanya NT5CC128M16IP-DI). 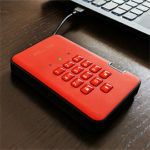 Furthermore, for the WiFi performance, the 2.4GHz radio band uses the Qualcomm IPQ4019 chipset along with a Skyworks SKY2623L power amplifier, while the first 5GHz radio also uses the Qualcomm IPQ4019 chip with an RFMD RFPA5542 power amplifier and the second 5GHz radio band uses the QCA9886 SoC along with an RFMD RFPA5542 power amplifier. 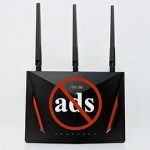 It doesn’t seem that Asus had much faith in either ZigBee or Z-Wave (it seems that other WiFi systems don’t either – such as the Google WiFi, that apparently has removed it from newer iterations, but the Samsung Connect did not shy away from implementing both), but you do get Bluetooth 4.0 which uses an Atheros AR3012 chip. 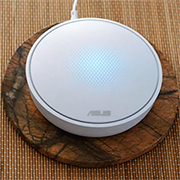 The Asus Lyra Home features a maximum theoretical data transfer of 400 Mbps using the 2.4GHz radio band and a maximum theoretical data transfer rate of 867 Mbps on each of the two available 5GHz radio bands (adds up to 2134 Mbps which are rounded to 2200 – the Asus Lyra is advertised as an AC2200-class system of routers). 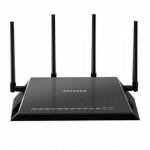 The WiFi systems are the natural evolution over the traditional router (+ at least an extender) in order to be able to cover a larger area in a more efficient way and to pull it off, the manufacturers were left to their own creativity. 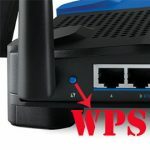 This way we got dual-band WiFi systems like the Google WiFi, Eero Second Generation, Ubiquiti AmpliFi HD or TP-Link Deco M5 which can deliver a solid performance for a small to medium sized house and there are tri-band systems such as the Linksys Velop, Eero Second Generation or the Netgear Orbi which are more suitable for larger homes with more devices to connect to the network. But, the key element was the inter-connectivity between the units and the handling of the backhaul traffic. The large majority of the WiFi systems have implemented the mesh technology (each has added some alterations, especially in the form of the client and backhaul handling within the available radio bands), while the Netgear Orbi refused to join the group for a while, but seems to gradually give in and, while before, it only worked as a Main unit and Satellites configuration, it now supports daisy-chaining, so there is present the communication between the satellites. 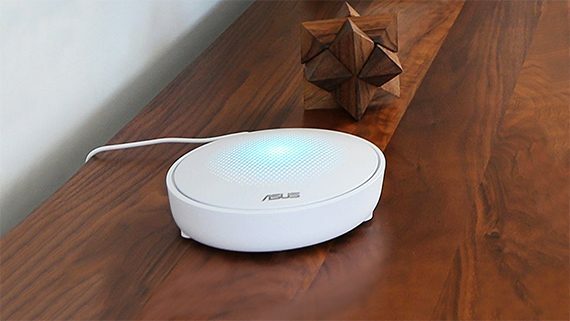 The Asus Lyra is part of the tri-band WiFi mesh systems group and it does take full advantage of all the qualities of the mesh technology. 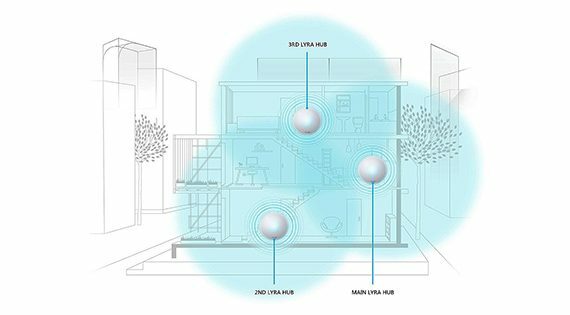 The most important aspect of a mesh WiFi system is the self-optimization property, which has the role of detecting all the nodes and create a large mesh network with the best paths and with the minimum interference in order for the data to reach the destination as fast as possible. Furthermore, a mesh network will also take advantage of the self-forming property which has the role of ensuring that any new unit added to the network is immediately becoming a functioning part of the mesh network and thus new paths can be created using the added node, therefore, once again, the data will reach it destination faster than before. In case a node fails, the network will scan for nearby units (to find the most suitable candidate by taking into account the distance between the nodes, the number of clients connected to that specific device, the signal strength and more) and attempt to create a new path for the data in order to ensure that the user doesn’t experience any downtime and that the information reaches the destination safely (which highlights another important element of a mesh network, the self-healing property). Between the Lyra and Deco M5,which would you recommend if both were the same price? The problem is that neither are really remarkable in any way, but if Asus Lyra and the Deco M5 would have the same price, for now, I would be inclined to go with TP-Link. 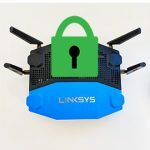 Lyra is still more powerful and if Asus gets their stuff together, it could fix their WiFi system and rise up to the levels of the other tri-band competitors (the AiMesh could prove that this is not really their main objective, but who knows). Eero 2nd generation is a really good system that you could also look into and the Google WiFi has become really cheap these days, so there are other better options (if they’re available in your region).